Thank you to Toni from Little Suitcase via Meet Me at Mikes for this week's inspiration. Usually I find myself wanting everything to look pretty. Here's my chance to display some of the more unaesthetic corners of my old rented home; ones I can't change or even disguise all that well. A little while ago I talked about the ancient swirly carpet that I have formed a love/hate relationship with. Today it is a collection of antiquated electrical-themed oddities. 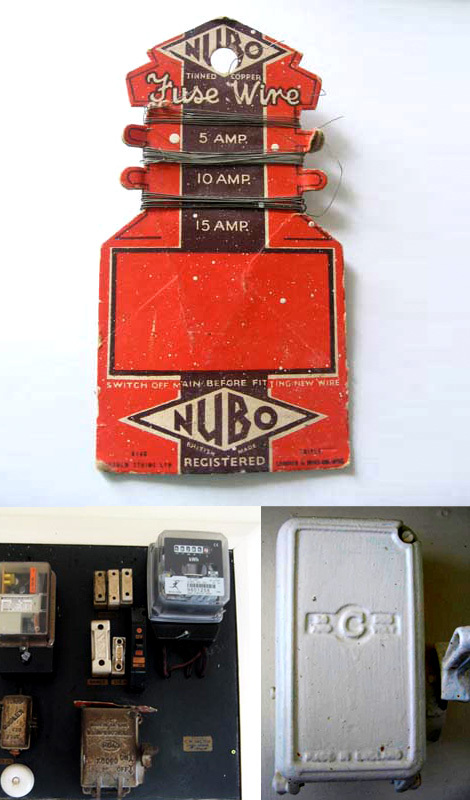 Firstly we have the dinosaur of a fuse board next to the front door, with its original ceramic fuse holders. It often makes an alarming humming sound, especially at night. Because it sticks out so far from the wall it's impossible to cover, so ignoring it is the best way to go. Then we have a switch of some kind, right above the stove. It may or may not do anything. The only thing I could do with it was to paint it white and, once again, ignore it. On a slightly more attractive note, here is a closeup of the original fuse wire. I like the design which looks as if it came from the 1930s, maybe. So there you go. Now I feel like going on a hunt for more strange and partially useless corners of my home - they shouldn't be too hard to find. The thing is, I have always lived in elderly eccentric houses, and have over the years tried to learn the art of disguise and concealment. I'm constantly googling things like 'How to hide an ugly ceiling fixture' and attempting DIY fix-ups that invariably go wrong. I wouldn't know what to do with myself in a shiny brand new house, I suspect.